After his epic two-part play "Angels in America: A Gay Fantasia on National Themes", the second part of which was titled "Perestroika", it seems logical that Tony Kushner in his next play should deal with perestroika in its country of origin. In many ways the 90-minute play "Slavs!" seems like an epilogue to "Angels in America", especially since its subtitle could apply to both works--"Thinking About the Longstanding Problems of Virtue and Happiness". The question in both is how to rebuild life within a system, which once based on ideals, has now collapsed. The "problems of virtue and happiness" in both works is how they are to be achieved or maintained when all the traditional signposts for judging them have disappeared. Both pit idealism versus pragmatism, intellect versus emotion, fantasy versus reality. Stylistically, too, both mix so many genres that Polonius' classification of "tragical-comical-historical-pastoral" is not far off the mark. "Slavs!" confirms that Kushner is one of the few American dramatists to follow in the path of Brecht in tackling big political topics in a non-naturalistic style. He is also one of the few to match strong intellectual content with poetic language and highly theatrical imagery. "Slavs!" is made up of a prologue, three acts and an epilogue all set between 1985 and 1992 in the crumbling Soviet Union. While the Tarragon calls the play a "satiric vaudeville", it actually traverses a series of styles in a regular way. 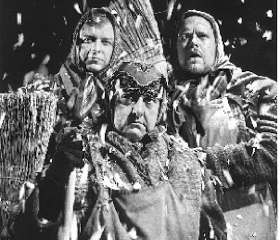 The prologue is a scene of Monty Pythonesque satire with two babushkas sweeping snow and arguing in elaborate vocabulary over the more arcane niceties of Marxist doctrine. When Party officials pass by on their way to a meeting, the two revert to caricatures of ignorant peasants, only to resume their discussion when the officials are gone. Act 1 continues in the satirical mode as the officials gather to listen to a speech by the world's oldest living Bolshevik. The central opposition in the play between head and heart is made clear in contrasting the Bolshevik, who cannot live without a theory, and the next oldest Politburo member, who is willing to leap (literally) into the unknown future. The Bolshevik dies of a brain aneurysm and the other from a heart attack brought on by his leaping. Act 2 makes a transition from satire to comedy. It begins in an archive of the preserved brains of all past communist leaders, but focusses on the unrequited love of a boring apparatchik for the woman who works there. Only with great difficulty is she able to convince him she not only dislikes him but is a lesbian. Act 3 moves from comedy to tragedy. It is set in a doctor's examining room in Siberia. The doctor, the lesbian's lover, wants a visiting official from Moscow to do something about all the deaths of children from cancer caused by radiation leaks. The doctor's criticism is continued on a powerfully personal level when the Lithuanian mother of the mute child to be examined sees the official's lack of interest as another of a long series of abuses she, her family and her people have suffered under the Soviet regime. The Epilogue set in heaven questions whether it is actually possible to achieve a paradise on earth by means of ideology. In the hands of a less sensitive director this play with such disparate moods could easily become a shambles. Fortunately, Tarragon Artistic Director Urjo Kareda matched this play with Dennis Garnhum, a young director whose clarity has put him much in demand. In 2001 he will direct shows at the Canadian Stage, Stratford and the Shaw, which must be a first. He handles the multiple genres and moods of the piece masterfully and moves us from satiric derision to a kind of enlightenment at the end--quite a feat in such a short space of time. In this he is aided by a superb ensemble of actors whose roles require rapid switches between ages and genders throughout the play. Maria Vacratsis shows her versatility in three totally different roles--the theorizing babushka of the Prologue, the ancient Bolshevik speaker and Lithuanian mother overcome with sorrow and rage. In this last role she is very powerful. Kelli Fox, a familiar face from the Shaw Festival, clearly relishes the chance to play her two very ungenteel roles--a pompous male conservative Party member in Act 1 and the lesbian archivist of Acts 2 and 3. The long scene in Act 2 when she becomes increasing drunk and randy is a tour de force performance. Brenda Robins takes quite a stretch when she plays the aged forward-looking official who dies from leaping and the concerned lover of the lesbian archivist. It's quite an eye-opener how expertly these female actors bring off their male roles. The two male actors are not given roles quite as demanding. Both play babushkas and are quite funny, but both are simple caricatures. Ashley Wright plays the apparatchik who tries in vain to woo the lesbian archivist. He gives the character a Chekhovian awareness of his own ridiculousness. Randy Hughson plays the uncaring Moscow official visiting Siberia. The off-hand way he sets out his nationalist party's fascist, anti-Semitic agenda is quite chilling. I should also mention Adanya Dunn, who plays the child so well and, in a daring move by the playwright, expertly delivers a speech in the Epilogue that basically summarizes the meaning of the play. Anyone who was fascinated by "Angels in America" will want to see this production, a sort of condensed version of the same themes seen from the point of view of the ex-superpower. I wish we did not have to wait six years to have Kushner's plays staged in Toronto since a certain urgency in their appeal goes missing. Still, we are lucky, when we do see one of them, if it is given such a fine production as this. Photo: Randy Hughson, Maria Vacratsis and Ashley Wright. ©2000 Tarragon Theatre.